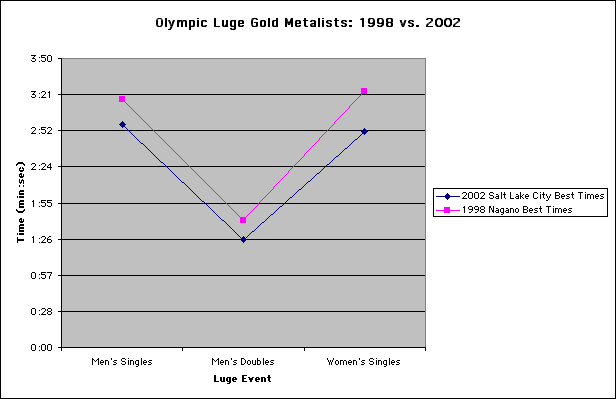 As demonstrated in this graph, the times for the Nagano course appears to be slower in general than those for the Salt Lake City course. This could be for one of several reasons. Firstly, the course may have been designed so that shorter runs could be possible (by, for example, having a very steep run at the start of the course so that lugers get to a higher speed faster). Secondly, the climate conditions in Salt Lake City were better than those in Nagano for luging; too high a temperature creates slush on the track, which greatly reduces the speed, while too low a temperature means that the ice is harder, and that it is therefore harder to dig into it and get traction to avoid the walls. With ice at just the right temperature, a very thin layer of water forms under the luge's runners (which are heated by the friction of running over ice at high speeds); this layer acts as a lubricant, but it is thin enough that the runners can still dig into the ice for traction on sharp turns. A third possibility is that the equipment was better; maybe one of the new materials developed between these games, for example, was able to reduce the friction between the runners and the ice. And finally, of course, it is always possible that the lugers in Salt Lake were just plain better than those in Nagano. I would predict that a combination of the above factors, not any single one, is the cause of this difference.